One solution is to go rule by rule on the new computer and edit every one... tediously un-checking the new line item "On this computer only." THIS DOESN'T ALWAYS WORK and it's certainly not the ideal way to handle moving rules. Also, if you have a lot of rules, then this may drive you mad. 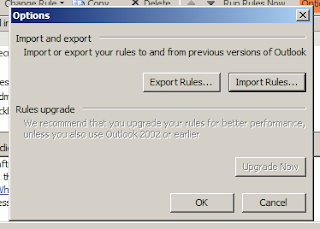 The better option is to export your rules from the original computer they were created on. This won't tie them to any computer, and allows you to import and use them wherever you want. 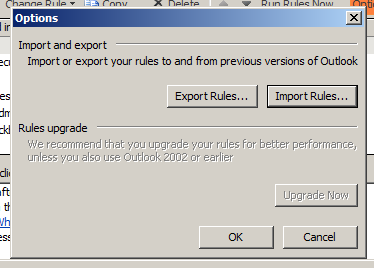 First, you'll have to export the rules from the original computer your Outlook was on. From here you can both Export and Import rules to a *.rwz file. Importing rules will not overwrite existing rules. So, you'll have to delete duplicates manually. This means that there isn't an automatic way to back up your rules. If you want to keep a backup, you'll have to manually export them every time you change anything. Bonus Fun Fact: You can select multiple rules at once in Outlook by clicking and dragging to highlight since CTRL or SHIFT clicking doesn't work.